Several myths about the Australian workforce are being widely circulated of late and discussed as if they were ‘facts’. One of these has been that ‘casualisation’ (that is, the incidence or proportion of casual work) is increasing in Australia. Quite simply, it hasn’t and it isn’t. We first addressed this growing misperception about ‘casualisation’ in a factsheet in 2016 Casual employment in Australia. And we are not alone. ‘Rising casualisation’ has been confirmed to be incorrect by the Fair Work Commission (e.g. see Casual & Part-time Modern Awards Decision July 2017), the Conversation’s factcheck unit in 2016, Professor Jeff Borland of the University of Melbourne (Job insecurity in Australia, no rising story in 2017) and the ABC’s factcheck team just a few weeks ago. There are many ways to define, measure and assess concepts such as ‘casualisation’ and ‘insecurity’. In our last BLOG we looked at workers’ perceptions of job insecurity, as measured by a longstanding question in the ABS labour force survey about workers’ expectations of changing jobs (How workers really feel about their job security). These data indicate that around 10% of the workforce expects to leave their current employer in the next 12 months, and that this proportion has not changed since 2001. About half of these people intend to change employers because they are seeking another job. In today’s BLOG, we look at the proportions of the workforce that are employed on a casual basis or are self-employed, since these are often used as proxies for ‘insecure’ or ‘temporary’ work. In both cases, there has been no recent increase in the proportion of the workforce who are working in this way. And in both cases, there is a wide variety of personal circumstances that lead people to choose to work on a casual basis or to become their own boss. These reasons are topics for another BLOG. So, why does this idea of ‘casualisation’ persist? First, although the ‘incidence’ (that is, the proportion or percentage) of casual work has not changed over the past two decades, the number of casual workers has risen over the past two decades, reflecting growth in our population and workforce (chart 1). The ABS estimates that the number of ‘employees without leave entitlements’ (the most common proxy for ‘casual’ work in various ABS labour force data series) grew from just under 1.7 million people in August 1998 to 2.6 million people in February 2018. 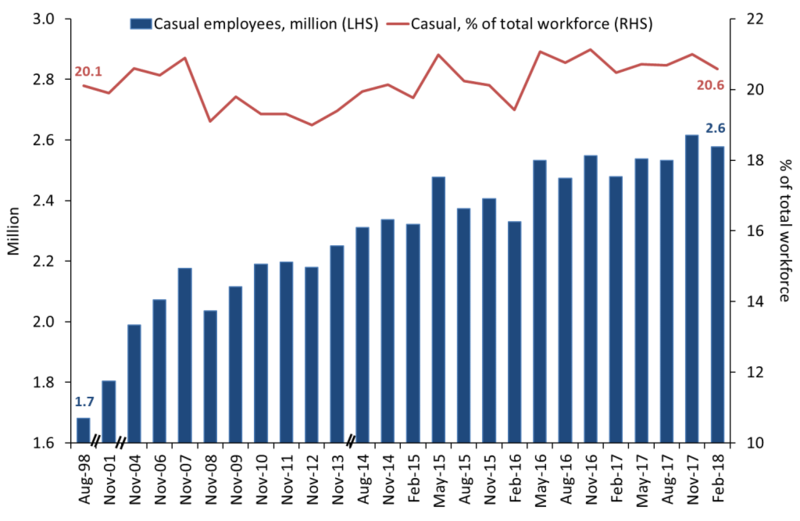 This sounds like a big increase, but in fact the proportion of casual work in the total workforce is almost unchanged over this entire period; 20.6% of the total workforce (or 24.7% of employees) in February 2018 compared with 20.1% in 1998. During this period, casual workers as a proportion of the total workforce hit a low of 19% in November 2012 and a high of 21.1% in November 2016. There is no indication in these national employment data that this proportion is rising. Sources: ABS characteristics of employment; Labour Force Australia, Detailed Quarterly. Note: these data were available intermittently from August 1998 to August 2014. Data from August 2014 to the present are available on a quarterly basis. Second, another category of work that is sometimes conflated with ‘casualisation’ is self-employment. Data on various types of self-employment are readily available for Australia’s national workforce from 1991. This indicates that – like casual workers – the number of ‘owner/managers of an enterprise’ (incorporated or unincorporated) with no employees of their own has risen, as our population and workforce have grown; from around 890,000 in 1991 to 1.3 million in 2018 (chart 2). As a proportion of the workforce however, self-employed workers with no employees of their own have hovered between 10.5 and 11.0% of the total workforce since 2012. 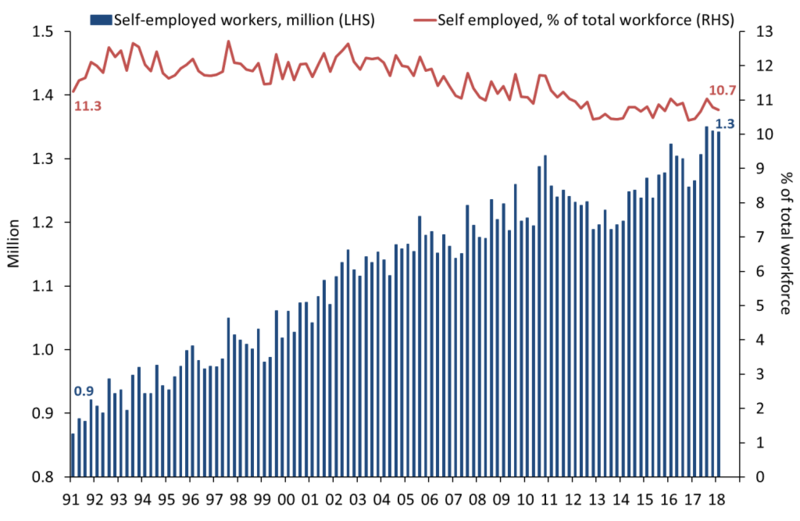 Looking at changes over a longer period, the proportion of self-employed workers with no employees of their own has fallen since the 1990s, when it was typically around 12% (chart 2). Again, there is no indication in the national employment data that their ‘incidence’ (proportion of the workforce) is rising. Third, temporary or insecure work can arise due to frequent changes of employment and/or very short durations of employment. Data on job tenure are more limited, but comparable data on people in work for less than 12 months are readily available for Australia’s national workforce from 2001. Again, the story seems to be that the number of people in short-duration work has grown, but their ‘incidence’ (proportion of the workforce) has not. In February 2018 (latest data available), 2.4 million workers had been in their current job for less than 12 months (19.1% of the total workforce), compared to 1.9 million in 2001 (21.4% of the workforce) (chart 3). 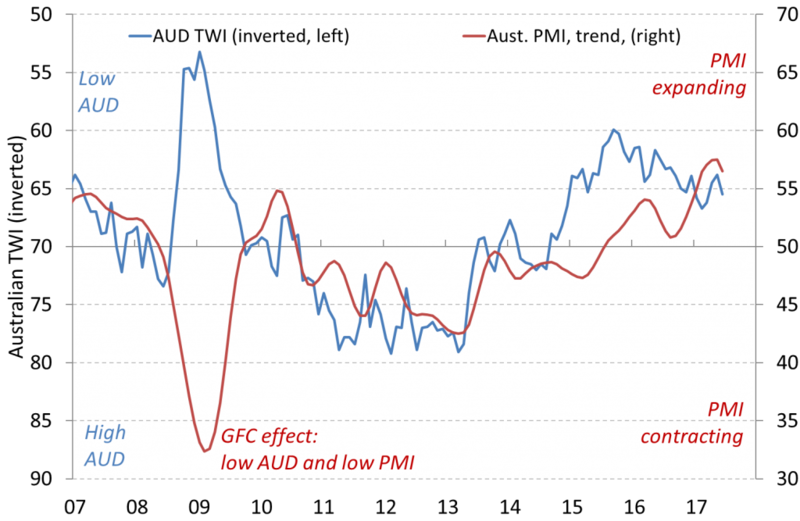 Over this century, the proportion of the workforce who have been with their current employer for less than 12 months fluctuated from a low of 16.9% in February 2014 to a high of 23.1% in November 2007, coinciding with the GFC. Fourth, casual work or ‘casualisation’ is often confused with part-time work. These are not the same thing, although they do overlap somewhat. ‘Casual’ work usually refers to the employment contract or employment relationship, while ‘part-time’ work simply refers to the number of hours. In the ABS labour force data for Australia, part-time work is defined as any paid employment of less than 35 hours per week. Although the incidence (proportion) of casual work has not changed over the past two decades, the incidence of part-time work has risen. This has happened for a variety of reasons including long-term demographic and social changes that have enabled more women and more older people to work. Part-time work has a strong gender element to it in Australia because so many more women work part-time (46.3% in April 2018 and at least 45% since 2009) than men (18.5% in April 2018) (chart 4). The strong rise in female workforce participation in recent years (to a record high of 60.6% of all adult women in April 2018) is closely correlated with this rise in part-time work. Looking more closely at this (growing) category of part-time work, there has been no apparent increase in the proportion of part-time workers who work on a casual or self-employment basis. Comparable data at this level of detail are readily available for Australia’s national workforce from 2014. This indicates that in February 2018, 43.0% of part-time workers were employees with no leave entitlements (i.e. 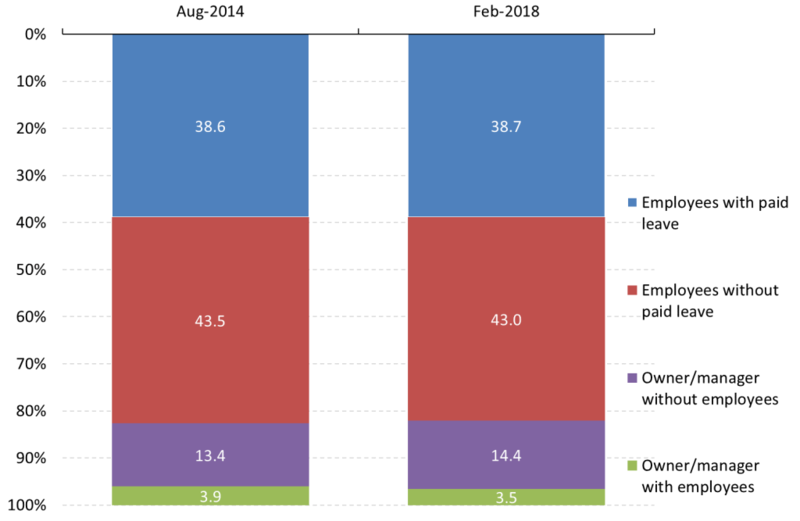 ‘casual’ employees), which is about the same proportion as in August 2014 (43.5%) (chart 5). The proportion of part-time workers who are owner/managers with no employees (i.e. ‘self-employed’) is also about the same, at 14.4% in 2018 and 13.4% in 2014. 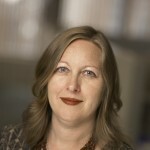 Many other aspects of employment can be characterised as indicating ‘casual’, ‘temporary’ or otherwise ‘insecure’ work, depending upon the assumptions that are made about people’s personal circumstances, preferences and decision-making capabilities. We shall continue to explore these issues in forthcoming BLOGS, as the relevant national labour force data are updated and published. I find these statistics very reassuring. As a business owner the casualisation I see is at the request from employees not by the business demands. Requests for more flexible work arrangements, shorter weeks, earlier finishes, all lead to more casual arrangements to cover the workload. Carl that is an excellent point. the ABS data also show that over three quarters of part-time workers (regardless of their work contract arrangements) are not available to work more hours. And that one third of unemployed people are looking for part-time work only, not for full-time work. So there is strong evidence that much of the rise in part-time work is being driven by the needs of employees’ rather than employers.